Running on long, seemingly endless roads in blowing sleet is hard. 17 miles of solo hill repeats is hard. Racing in blowing sand is hard. Hours of trudging through hip-deep snow in the mountains, unsure of how to get back and out of food is really hard. And so is heading into a 50M run when it is 8 degrees out. 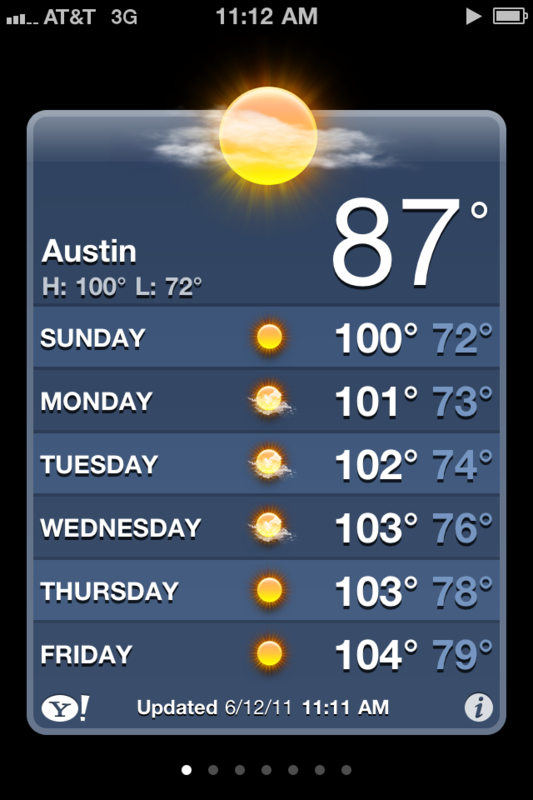 But nothing takes as much out of me as heat, specifically the relentless, humid, blazing heat of Austin in the summer. It isn’t so bad for hanging out at the pool or on the lake or in the shade with a margarita or three but it is a lot like punishment for endurance athletes. Luckily I have (1) learned to love the treadmill and, (2) been able to find a way to get to higher elevation to escape some of the most brutal parts of the year. Below is the forecast for the week, right from my iPhone. By my quick calculations, we can expect it to be approaching 200 degrees here sometime in September. You could fry an egg on the pool.